The Tampa Bay Lightning have signed goaltender Sebastien Caron to a one-year, one-way contract, Vice President and General Manager Steve Yzerman announced today. Caron will be placed on waivers today and would clear tomorrow at noon. Caron, 31, has played in 49 games this season with the Iserlohn Roosters of the German Elite League, posting a 25-23-0 record with a 2.57 goals against average and 0.932 save percentage. The 6-foot-1, 184-pound goaltender ranked second in the league in save percentage and ninth in goals against average. 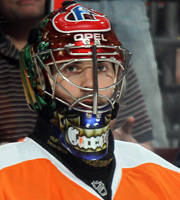 Caron notched five shutouts during the season, which also ranked second in the league. The Amqui, Quebec native has appeared in 92 career NHL games, compiling a record of 25-47-14 with a 3.45 goals against average and 0.892 save percentage. Caron last played in the NHL during the 2006-07 season, appearing in a total of two games while splitting time with the Anaheim Ducks and Chicago Blackhawks and posted a win for each team. He has played in 149 career American Hockey League games over six seasons with the Portland Pirates, Norfolk Admirals and Wilkes-Barre/Scranton Penguins. In those games he earned a record of 59-66-20 with a 2.97 goals against average and 0.895 save percentage. Caron was originally drafted by the Pittsburgh Penguins in the third round, 86th overall, in the 1999 NHL Entry Draft.